Yesterday’s decision by the FED to increase the discount rate – this is the rate at which commercial banks borrow from the central bank and is the first rise since August 2007 when the FED began its fight against the current financial crisis. At the time the cut in the rate was one of its first moves to help liquidity in the financial system and it also lengthened the loan maturing to a maximum of 30 days. The discount rate will rise of today from 0.5% to 0.75% and the length of loan will also be returned to a maximum of overnight – sent the euro into free fall. The eurodollar crashed through our initial USD1.35 target, ending the trading session as a wide spread down bar which closed well below the recent sideways consolidation which now sits as resistance above. 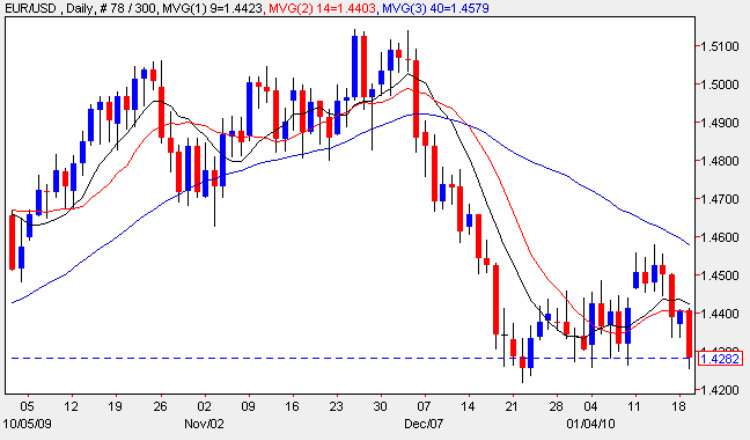 The high of yesterday was also unable to breach the 9 day moving average which is now adding additional pressure to the bearish sentiment self evident in this pair and with the 200 day moving average now beginning to turn lower the longer term outlook for the eurodollar remains an initial test of USD1.30 with even a possible drop to USD1.25, in due course. With only second tier fundamental news due out in Europe this morning – Flash Services & Manufacturing PMI for Germany, France and Europe as well as the current account balance, expect prices to take a breather as the markets digest yesterday’s shock announcement. Traders will then switch to this afternoon’s red flag Core CPI release from the US, which is expected to come in at 0.2% against a previous of 0.1%. Is Spain the next shoe to drop?